Only hours after his boss leaves for a weeklong vacation, Chet McGill, the dedicated VP of sales at AlphaMax Manufacturing, is under fire. Trident, his biggest client, is being pursued aggressively by a new competitor. At the same time, Chet is feeling more than a little off as he preps for a golf tournament in which he’s partnered with Trident’s VP of Operations. Faced with big problems and with all eyes on him, Chet learns to get back to what’s most important to his company, his clients and himself in Plugged. Plugged will fire up you—and your team—with its unique combination of business drama and personal challenges about getting the right things done … and winning! A perfect airplane read, the lessons will resonate with readers and provide powerful take-away value for everyone in the business world. Plugged is a road map for you and your team on how to dig out and get the right things done. 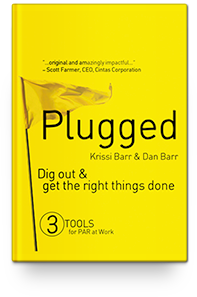 "Using the power of story and metaphor, Krissi and Dan Barr tell a mesmerizing tale of business, golf, and overcoming challenge in their book, Plugged! As engaging as it is practical, Plugged is for anyone looking to overcome today's challenges be it in the boardroom or on the golf course!" -Marshall Goldsmith, author of the NYT and WSJ #1 best-selling author of What Got You There Won't Get You There and the recently published Succession: Are You Ready? "Dan and Krissi weave important business lessons with golf to produce an original and amazingly impactful book. Plugged will help everyone raise their game and improve the entire team's score. Its powerful principles are perfect for anyone and any team." "Plugged is extremely human. They became obsessed with their customers. Once they got busy and genuinely concerned, they got done what they needed to and it worked. Plugged humanized and emotionalized the rationale. And you don’t have to be a golfer to get this message." "Plugged is an outstanding method of demonstrating principles of leadership and management. The plot of the story between AlphaMax and Trident certainly set the stage for the 19th hole. It should be required reading for all managers." Krissi and Dan Barr are dynamic business people who live in Cincinnati. Both are graduates of Miami University, the school where Krissi also earned her MBA. 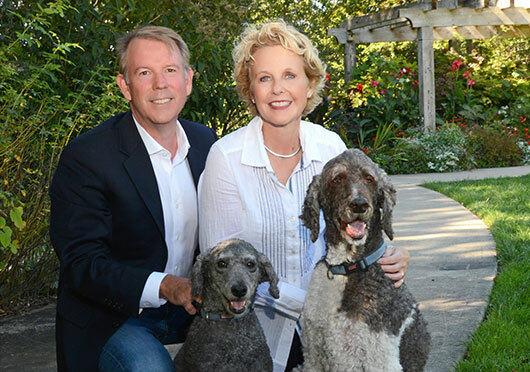 They’re also the authors of two breakout business books – The Fido Factor: How to Get a Leg Up at Work and Plugged: Dig Out and Get the Right Things Done. Krissi is President and Founder of Barr Corporate Success, a business consulting and coaching firm. Specializing in strategies to implement initiatives and maximize profitability, her interdisciplinary approach to business draws from her extensive background. Her industry experience includes banking, high-tech, service-based, international business, and manufacturing within a variety of companies from global Fortune 500’s, mid-sized established firms to start-ups and family businesses. Dan is the COO for Barr Corporate Success, an accomplished sales & marketing executive and an entrepreneur. He has worked at BELFOR/1-800-WATER-DAMAGE, Cintas, his family’s businesses and for his own enterprises. Are you and your team playing up to PAR?